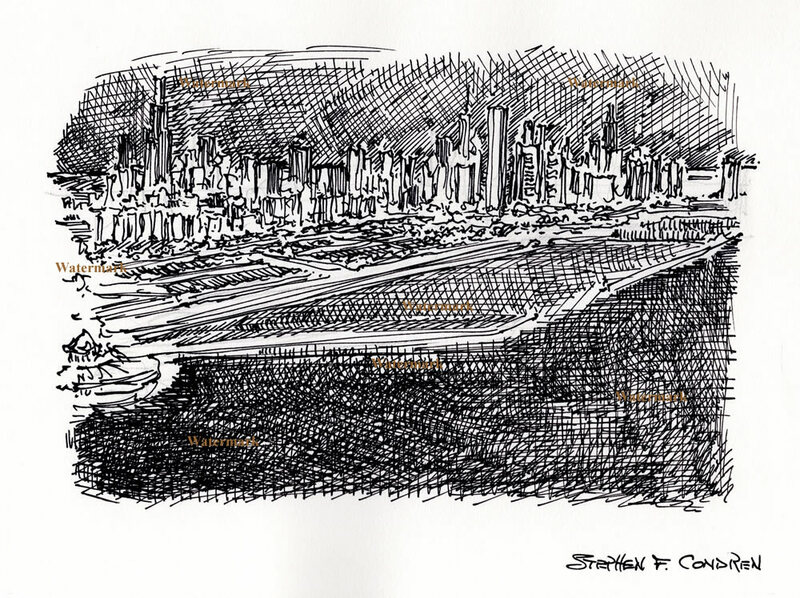 This pen & ink cityscape of the Chicago skyline #746B, which is for sale here, at discount with prints by artist Stephen F. Condren, SAIC, of Condren Galleries, a Fine Arts Gallery, offering JPEG & PDF scans. Clearly this rendering is done at night by the mere title and dark drawing. However, the night time brings out an interesting quality to skyline. The darkness gives you freedom to work different forms with the images of the buildings and landscape. You are now more free to work the shadows and architectural images into a more cohesive composition. You are not locked into copying all of the buildings in their proper place and proportion. Rather, you can work with their forms and create an even strong cityscape. For example, the bottom of the drawing is the darkest. I have done this so that it will visually support the images above. The intense use of cross-hatching frees me up to look for light reflected in the image from the sky. I do not have to worry about capturing the seascape or waves. The composition is more important than the details. Because the center ground of the drawing is based on the Plan of Chicago by Daniel H. Burnham Harbor. Mr. Burnham is a famed Chicago architect and we both share the same birthday! In the middle and just above the harbor is the world famous “Chicago Loop”. This area has the greatest concentration of skyscrapers in Chicago. Notable buildings are Willis Tower, Trump Tower, and Aon Center. I have made the sky with intense cross-hatching to let light emit from the sunset.